Nostra Signora di Fatima. Filippine 2017. BLOCCO FOGLIETTO - NUOVO MNH . OCCORRE AGGIUNGERE IL. Type Cover. Quality Used. Condizione: sporcato. (Block with 4 values (4v Block): P12 x 4. You will be back for more! 3) Select each item and 'Add to Basket'. (Block with 4 values (4v Block) P12 x 4. You will be back for more! 3) Select each item and 'Add to Basket'. 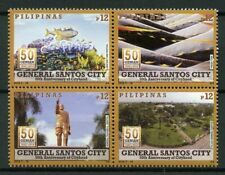 (Philippines 2018 General Santos City - 50th Anniversary of Cityhood - Mint Never Hinged (MNH). Block with 4 values (4v Block): P12 x 4. You will be back for more! 3) Select each item and 'Add to Basket'. 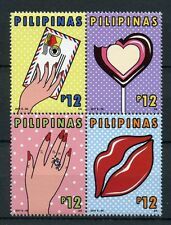 (Philippines 2017 Christmas - Pasko - Children's Drawings - Mint Never Hinged (MNH). Block with 4 values (4v Block): P12 x 4. You will be back for more! 3) Select each item and 'Add to Basket'. Block with 4 values (4v Block) (P12) - San Matias Church - Tumanini - Isabella. (P12) - Santa Monica Church - Pan-ay - Capiz. (P12) - Santa Monica Church - Minalin - Pampagna. (P12) - Santa Catalina de Alejandria Church - Tayum Abra. Seconda GUERRA MONDIALE OCCUPAZIONE GIAPPONESE DELLE FILIPPINE. Blocco di 4 FRANCOBOLLI rilasciati nel 1943. 50th ANNIV OF WWF ( PHILIPPINE CROCODILES) BLOCK OF FOUR. No Exclusions. Condition: Mint Never Hinged. Date of issue: 15 July 1997. Yvert No. : 2354-2357.
:- The item you receive may not be the item scanned, but will be of similar quality. Date of issue: 03 August 1979. No Exclusions. Condition: Mint Never Hinged. Glauben Sie, dass der Preis ist nicht richtig?. :- The item you receive may not be the item scanned, but will be of similar quality. No Exclusions. Condition: Mint Never Hinged. Date of issue: 03 August 1979. Filippine; 1962 Early ORCHIDEE emissione Nuovo di zecca Gomma integra, non linguellato non montato blocco. PHILIPPINES; 1962 early Orchids issue Mint MNH Unmounted BLOCK., . Filippine 1956 MacArthur Leyte Imperf blocco sul chiusino... afran TIMBRO rivenditore ENV. 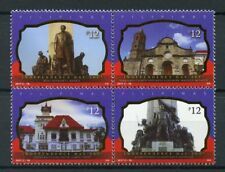 Philippines - 200 years independence United States MiNr. 1172-1175 block 9 a 1976 used. 1172-1175 block 9 a 1976 used (A001) condition: used, o, stamped.